When I posted Mouclade, a few days ago, remember, I promised an Italian version of mussels made with fennel, onion and sausage. I made the dish from Bon Appetit Magazine and while it looks fantastic and appetizing, the flavors and textures didn’t come together as I had envisioned, and I created a different dish, inspired with saffron. I read that mouclade (mussels with cream) can be made flavored with saffron, which not only did I have on hand, but saffron pasta was sitting in the pantry waiting for inspiration and there was Italian sausage left over. It’s simple, hearty, flavorful, and if you don’t have saffron pasta on hand, I went ahead and made some for you here. 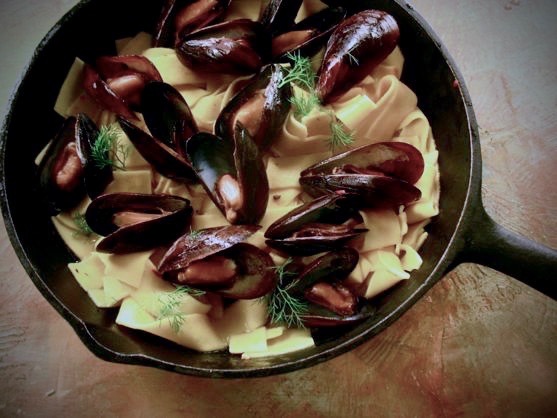 In the post for mouclade, there are some great tips for preparing mussels and a rather lively debate in the comments section. As the most expensive spice in the world, saffron deserves a tutorial, so as to not waste a single saffron thread. Just as I accidentally killed a few mussels making mouclade, I accidentally reduced the flavor of the saffron by using a wooden spoon, and as the most expensive spice in the world, I won’t be making that mistake again, and now, neither will you. Notice the red/orange tips, which means this saffron was not tinted and is a good quality. • Saffron quality is judged by the color. The more vivid the color, the higher the quality, but avoid saffron that has been tinted, by looking for threads with red/orange tips, or knowing your source. • Steep in a ratio of 1-3 saffron to hot water for two hours, prior to using. Heat releases the flavor and unlike other spices, saffron flavor continues to grow for up to twelve hours and will be brighter in left overs. • Do not crush saffron, unless you don’t have the two-hour steeping time. Then decrease hot water, crush with pestle and mortar and allow to sit for 30 minutes. • Purchase threads instead of powder. Powder tends to lose fragrance. • Do not use a wooden spoon, which will absorb the fragrance of the saffron. • Stored in a dark place, saffron should keep for a long time. • Spain is the world’s largest exporter of saffron, although Iran is the largest cultivator. (You don’t really need to know that, but I thought it was interesting and solved for me the “spanish saffron” curiosity. 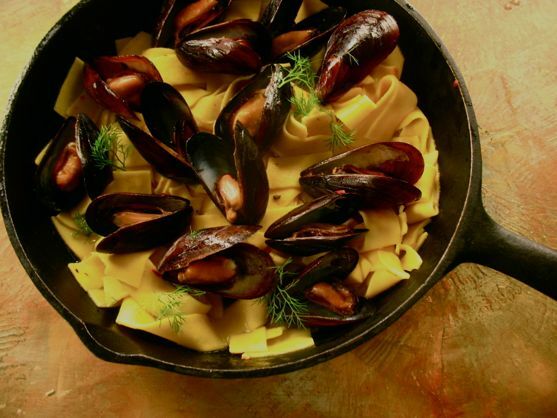 Tips for Purchasing, Storing, Cleaning Mussels can be found here. Saute onion for two minutes. Add garlic. Add sausage, cut on diagonal. Once sausage is nearly cooked, add wine, bring to boil. Cover. Cook for 3-6 minutes, just until mussels are opened. Serve over cooked pasta that has been tossed with a tiny bit olive oil, salt, pepper. Make sure to use all the juices from the pan for the pasta. If you don’t like mussels, this pasta is good alone or with some sausage and/or shrimp.